Once a year we assemble a pseudo-hi def TV for my 12 yo's Super Bowl event. We've improved on the old rig; the VRC am has been replaced with a digital to analog converter box. The rabbit ears are unchanged; they work great. The rabbit ears and the converter box come up from the basement. My 24" Dell LCD comes down from the study. Audio goes to the shrunken amp that normally manages our AirTunes. It's a pretty light setup these days. 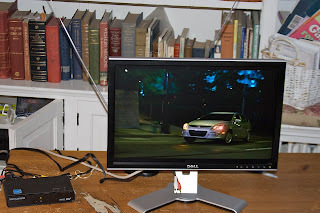 The D/A converter is a tuner as well, so all I need is my Dell monitor and our ancient rabbit ears (you can see them poking up behind the TV). The image is pretty impressive. I don't know how it compares to real hi-def, but it seems way sharp to me. Of course I'm not the most discerning TV guy. In any case, it's sharp enough for my son to ask why the blond talking heads look weird. He's right. There's something wrong. Their faces don't move properly. They seem flat ... artificial ... frozen. Welcome to the hi-def Botox syndrome. Creepy -- these people could definitely pass for androids. Well, there's always a spot on any future remake of Brazil.